Stirling Mortlock is among the vocal critics of the World Cup runners-up, but Cheika says the Australian thing to do is get behind the team. AUSTRALIA COACH MICHAEL Cheika struck back at mounting criticism of his side as he looks for a face-saving performance in Saturday’s second Test against New Zealand. After being humiliated 42-8 in Sydney last week, the Wallabies have been publicly rubbished by fans, the media and even ex-Test players ahead of the return match in Wellington. But Cheika suggested such a reaction was un-Australian and true supporters would back the team. In a scathing review, former Wallabies skipper Stirling Mortlock said the side had problems across the board. “There’s set piece issues, there’s defence issues, there’s breakdown issues, there’s kicking issues … there’s not many good things going on currently,” Mortlock said. Ex-Test player Clyde Rathbone said the Wallabies were delusional about their ability, adding they were “almost certainly not going to win” the return clash. Cheika put on a brave face, saying the team had conducted a thorough analysis of last week’s performance and believed they had addressed the key issues. “Obviously it’s going to be a difficult match to come back into after last week,” he said. But Cheika said the barbs from former Wallabies hurt, although a lot of other players had made contact with the team and offered their support. “When it gets tough, it’s very easy for people to jump on and put the boot in and we have to take it because we haven’t performed,” he said. “But when it gets tough that’s the time you show your colours. I know where my colours are. “At the end of the day, no matter what sport Australia’s playing I’ll be supporting them no matter what,” he said, recalling how he backed former Australian cricket great Greg Chappell when he went through a bad patch against the West Indies in 1981. Wallabies captain Stephen Moore also dismissed the criticism. 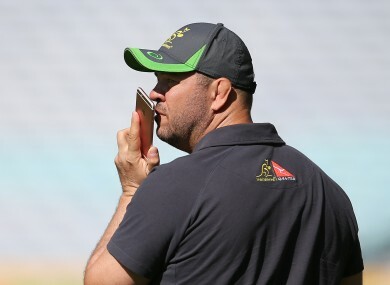 Email “'It's very easy for people to put the boot in': Cheika tells critics to back wounded Wallabies”. Feedback on “'It's very easy for people to put the boot in': Cheika tells critics to back wounded Wallabies”.